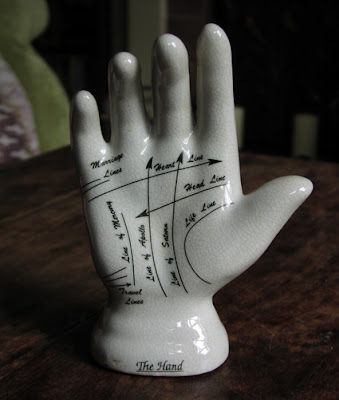 My latest charity shop find is this ceramic palmistry hand. When I bought it, the young man behind the counter seemed so disappointed to see it go that I offered to leave it for him if he had been hoping to buy it himself, but he said that it was OK. I'm not sure how useful the hand actually is as an aid for learning palmistry - it only shows the very basic hand lines - but it does look just the part on display in my witchy room, along with my besom, cauldron, crystal ball and esoteric books.